Martyn Rowland is a London-based Magician who entertains at parties, weddings and corporate events worldwide. He is the Co-Writer and Magic Producer of the hit ITV2 Magic Show 'Tricked' and a member of The Inner Magic Circle. If you are looking for a magician for your event, there's much to consider. You need someone who is entertaining and an excellent magician (obviously), but experience and reliability are just as important. Martyn ticks all the boxes. Martyn is a full time magician who has been working professionally since 2001. He is always in demand and works at hundreds of events every year. He's an award winning member of The Inner Magic Circle* in London, and has hosted dozens of parties and events at their prestigious Headquarters in Euston, London. Although based in London Magician Martyn Rowland performs at events all over the UK and abroad. Wembley Stadium in London has booked him as their Resident Magician since 2008 to perform close-up table magic in the Bobby Moore Suite, and he has performed his magic at Buckingham Palace, 10 Downing Street and the House of Lords. He also won The Magic Circle Originality Award. *The Inner Magic Circle is the highest degree in the society and is limited to just 300 worldwide at any time. Martyn is one of the country’s most experienced magicians. He performs mind-blowing walk around magic, table magic, and stage magic, at private parties, corporate events and weddings. As a close up magician, Martyn demonstrates the power of the mind with his amazing mix of psychology and mind reading. He'll reveal a guest's secret drawing, reveal their thoughts and cause coins to bend whilst in their hand. He'll even make it possible for your guests to read each others minds. The focus throughout is on humour, but it can get scary! 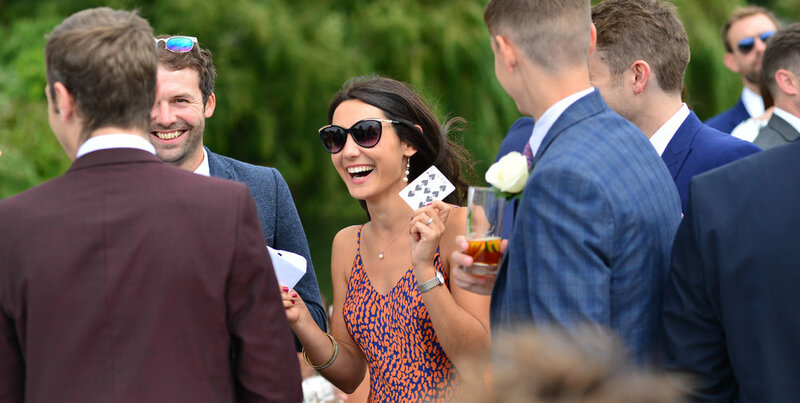 As a Corporate Magician in the UK, Martyn has performed sleight of hand magic for over 95% of companies in the FTSE 100, and has a wealth of experience at entertaining at all kinds of company events. "Everything you could want from a magician - entertaining, engaging, brilliantly funny and his magic is mindblowing!" Thank you! You'll receive details of Martyn's availability via email.